I understand that it can be easy to watch parkour videos on YouTube of young athletes jumping between skyscrapers, or performing Olympic-level acrobatics over concrete, and come away feeling like it’s a dangerous fringe sport reserved for adrenaline junkies. The fact is that this extreme element of parkour is but one branch of a much larger tree, and to denounce the practice in its entirety based on that branch would be similar to refusing to drive your own car because you saw a dangerous looking NASCAR race. This is one reason why we are excited to release our fourteenth episode of the Evolve Move Play Podcast featuring our good friend Julie Angel. If you don’t know Julie, she is a documentary filmmaker, author, instructor, and all around amazing leader/advocate for parkour and the movement community. Her films have over 16 million views online. Her book “Breaking The Jump” is a must-read for anyone interested in the history and origins of parkour, and her company See&Do is committed to teaching sustainable, parkour-based movement practices to people from all walks of life. 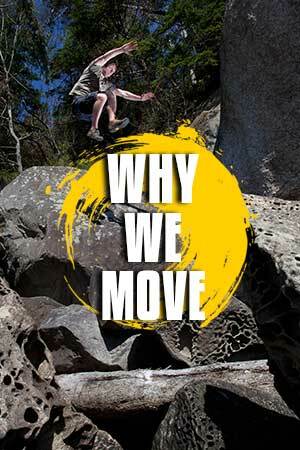 As someone who started parkour later in her life, dealing with fear, anxiety, and self doubt while finding her place in the international community, she is a bright example of how movement can change and empower each and every one of us. Julie is a delightful person to talk with and I think you’ll really enjoy hearing the stories of her experiences and her unique thoughts on what movement and parkour offer for improving health and quality of life for people of all ages and abilities.